Modern Android versions come with a security (?) 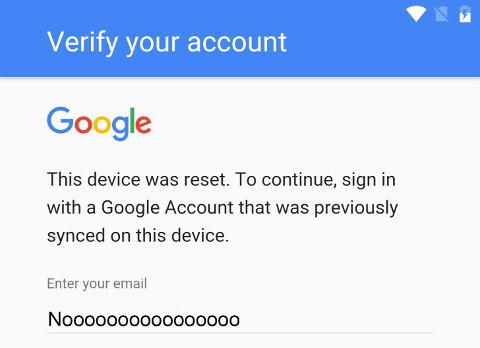 mechanism which requires the user to log in with a Google account previously used on the phone after a factory reset. There are dozens of different instructions for how to bypass this protection on the web, but none of the ones I tried to follow worked on the phone in question, an Asus ZenFone Go (ZB452KG). There are probably multiple firmware versions around for this phone model alone, so what works on one phone may not work on another. However, the various tutorials I found helped me discover a method that did work on my phone. Ingredients: You will need a non-Google e-mail account to add to the phone, as well as the IMAP and STMP settings for your e-mail provider. You can remove this account after we're finished. The goal: The goal of this exercise is to disable the Google apps in the phone settings: if they are disabled, the setup wizard will skip the account validation step. The trick is how to get to the phone settings before unlocking it. Follow the setup wizard until you get to the account validation screen. I recommend that, at the beginning of the wizard, you choose English as language, so that the Google app names all begin with "Google" and so are listed all together and are easier to find. Select the e-mail field to open up the keyboard, tap the "⋮" button, select "Share", and "GMail". Click "Skip" at the initial GMail screen. GMail will ask you to add an account. Configure your non-Google account here. When you get to the compose message screen, tap the "⋮" button on the top right, choose "Settings", hit "⋮" again, and "Manage accounts". It will say "You're about to go to the Settings app …"; hit "Continue". Now we're at the phone settings! Note: I actually disabled a bunch of other apps with names beginning with "Google" (such as "Google Services Framework") when I did this; I think this is not strictly necessary, but you can try it if disabling just "Google Account Manager" does not work. Go back to the beginning of the setup wizard and follow the normal setup steps. Now at the point it would ask you for a Google account, it should ask for your name and surname instead. If this happens, it worked! Just finish the wizard and you'll have your phone unlocked. If it does not work, try to go to "Settings > Apps > All" again and force stop the "Setup Wizard" applications (there are two of them on my phone), and then try to restart the wizard (you may have to turn your phone off and on again for that). If you wish, go back to Settings and re-enable the apps you disabled. You can now also remove your IMAP e-mail account if desired.